Roughly one-million Australians suffer from diabetes, and best medical guesses are that at least half again that number have diabetes but do not know they suffer from it. Diabetes spreads across ages and demographics. The prevalence of type 2 diabetes, for instance, rises with age and is higher in men than in women. On the other hand, type 1 diabetes typically hits at an early age, and thus it is the most common form of childhood diabetes, although Type 1 diabetes can occur at any age. Australia is ranked 7th highest in the world for prevalence of type 1 diabetes in children under 14 years old. Even worse, there is a growing number of children and adolescents who are now affected by type 2 diabetes. In all, some 5% of Australians have diabetes. At Bondi Dental we would like to spread the message that not only is diabetes dangerous, but it is associated with serious dental problems as well, and that diabetes and periodontal disease can combine as a kind of “tag-team” of diseases that support each other. About one-third of people with diabetes have severe periodontal disease, which causes the gum tissue and bone around the teeth to break down. People with poorly-controlled diabetes (in this case primarily meaning poorly controlled glucose levels) had a 2.9 times increased risk of developing periodontitis compared to non-diabetics, according to a study published in 2002. The same study found people with well-controlled diabetes had no significant increase in the risk of periodontitis. Because diabetes can contribute to major damage to your teeth and gums, it is important to know about this connection, and what to do to break it. Just as high blood glucose makes it easier for you to get an infection in general, high blood glucose levels also make it easier to get a gum or mouth infection. Periodontal disease is an infection of the gum and the bone that holds your teeth in the jaw. When periodontal disease is untreated, it can lead to higher levels of blood glucose. This can set up a feedback loop in which periodontal disease leads to diabetes, and diabetes leads to periodontal disease. Chewing can become painful, and teeth may be lost. 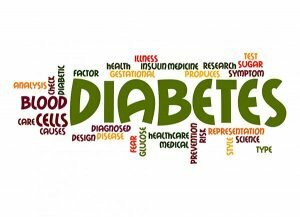 What is the relationship between diabetes and periodontal problems? Periodontal disease is linked to how well you are in control of your blood glucose. If your diabetes is well controlled, you have about the same risk of periodontal disease as non-diabetics. So managing blood glucose is a major key to dental health for diabetics. In diabetes, the walls of blood vessels that deliver oxygen to the body thicken, which slows the transportation of nutrients to tissues as well as the transportation of waste away from them. This decreases resistance to infection, and it becomes easier for periodontal disease to set in. Bacteria grows more easily in the mouths of people with poorly controlled blood glucose. This makes it more likely that some bacteria will enter the gum and bone, setting the stage for periodontal disease. Smoking makes this even worse. Nicotine replaces oxygen in the blood stream to all tissues, including gum and bone in the mouth. Smokers are as much as 5 times more likely than nonsmokers to suffer from gum disease. Other problems related to diabetes are dry mouth and a fungal infection called thrush. Dry mouth happens when you do not have enough saliva—the fluid that keeps your mouth wet. Diabetes may also cause the glucose level in your saliva to increase. Together, these problems may lead to thrush, which causes painful white patches in your mouth. Visit your dentist regularly. Be sure to tell your dentist that you have diabetes. Tell your dentist if your dentures (false teeth) do not fit right, or if your gums are sore. Remember, good blood glucose control can help prevent mouth problems and good dental health can help control diabetes. Bondi Dental is located in the Sydney area, at Bondi Beach. We offer high quality dental preventative, restorative, and cosmetics services for all patients, including children. Bondi Dental offers free parking at the rear of the building and FREE Dental Consultation including a complete dental check-up. Call us on (02) 9365 7187 or book your appointment online.